Many people put a premium on stress relief routines. There are just so many things to take care of – in terms of work, family and personal life – that can leave your body literally aching by the end of a long day. Not to mention that most of our routines involve sitting behind a desk for hours, which can cause chronic pains in our muscles and spine. Your body needs to de-stress on a daily basis. However, you simply can’t go to the spa everyday! You’d end up spending too much for treatments that would be too intense to be done that frequently. What’s the solution? Having a massage cushion at home! With so many technological developments now, massage cushions offer the most affordable and convenient way to relax your body after each day. Pain relief: Massage cushions can provide instant relief for chronic pain, especially in affected areas such as neck, shoulders and back. Their kneading and acupressure features can stimulate blood circulation and decompress the muscle tissues, thus alleviating pain caused by any strain, including headaches or migraine, arthritis, and sciatica. Convenience: Massage cushions are unbeatable when it comes to convenience. They are portable, can be plugged anywhere, and require little effort to be used. You don’t need to make an appointment for a spa treatment. Just plug it in and get a nice, soothing massage whether you’re at home or on a trip. Affordability: Massage cushions are more reasonable when compared to frequent trips to a massage therapist, or buying a massage chair. It’s one of the most affordable ways you can add relaxation to your daily routine. This refers to a massage device that is strapped onto a chair. It could consist of rollers, nodes or air chambers or a combination of all of these materials. From its name, this is a pillow or a soft cushion available in custom shapes and sizes for different body parts (e.g. neck, lower back). It has massage nodes or vibration points that provide muscle relief. What Massage Techniques are replicated in Massage Cushions? Air bags or air pockets are basically air bags built inside massage pads that inflate or deflate your different body parts, mimicking the gentle but firm pressure provided by a massage therapist. While these vary in shape, size and number, they are essentially designed to emulate the sensation felt from a masseuse’s fingers and hands. Large nodes provide overall comfort, while smaller nodes target specific areas on the user’s body to give a more intense treatment. Percussion, or tapotement is a technique that’s part of Swedish massage. It is a rhythmic percussion, done using the edge of a hand, a cupped hand or fingertips. It provides rapid and short pulses to muscle tissues to stretch them. This is a Japanese massage technique that literally means finger pressure. Shiatsu mainly applies circular rubbing motion to meridian points–locations identified in the age-old practice of acupuncture. Also originating from Swedish massage, kneading or petrissage involves squeezing, rolling and wringing deeper muscles and fascia. This eliminates the knots you feel when you have fatigued muscles. As with any form of massage, the level of pressure or intensity must vary according to what relieves you. Look for a massage cushion or pad that has intensity settings, so that you can adjust it depending on your needs for that particular day. Besides intensity settings, massage cushions that have speed settings are generally more useful, as the user could opt for a rigorous massage, or slow and gentle strokes. Some models provide additional vibration function that adds another element of relief for your body. Massage cushions may also come with a heat feature to stimulate and add a soothing sensation for the muscles. Infrared heat is even better than regular heating, as it rehabilitates muscles using infrared technology at a cellular level! A timer can be quite useful if you want a set period for the massage. You could control the length of each massage session with a handy timer. Massages are very relaxing that it’s sometimes a hassle to have to get up and turn off the device. An auto shut down feature solves that. You can stay relaxed throughout the duration of the massage, and avoid the overuse of the equipment. 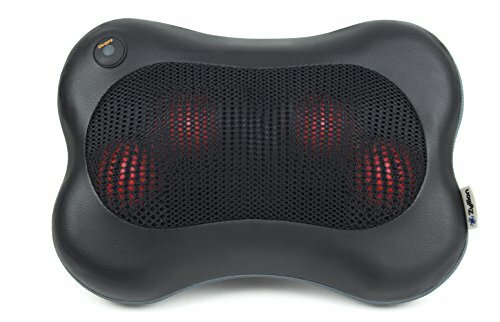 This is a great feature, especially when you’re frequently on the go and need your massage cushion with you everywhere. It’s best to check the length of time the product needs to be charged. If you want a faster way to set the massage intensity and style you’ve enjoyed previously, then pick a model that has a memory/recall function. That way, you don’t have to start from scratch each day. The Tenker Shiatsu Neck and Back Seat Massage Cushion has the best features in terms of massage quality and convenience. It mainly provides shiatsu massage with its 8 rolling massage nodes. Up and down motion is adjustable to fit the curves of the body can be set. The leather cushion is also built with seat vibration that has 3 intensity levels (low, medium and high settings). And to complete the experience, a heating function gives each massage an enhanced soothing effect. This massage cushion comes with a timer function – 15 minute period to shut off automatically, guaranteeing safety. And the strapping system lets you attach this cushion securely on any seat, be it at home, on your car or at the office. 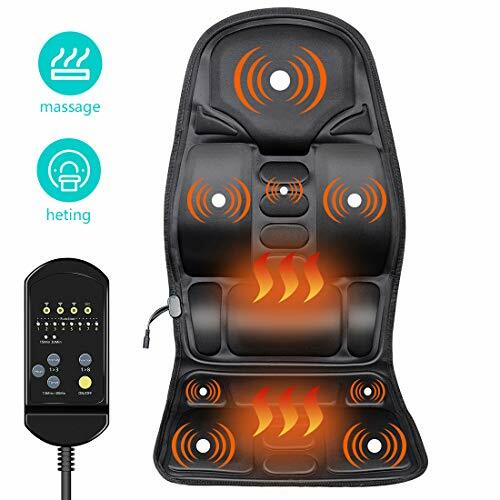 All in all, this massage cushion gives the most number of features for the price. 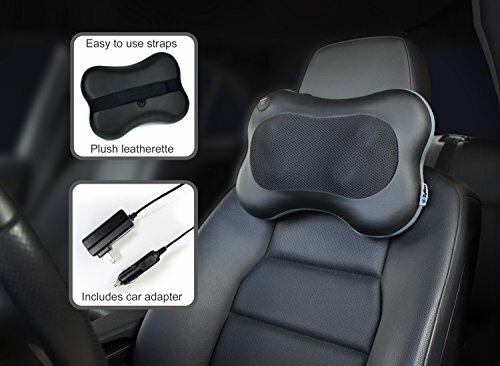 The SNAILAX Cooling Car Seat Cushion with Massage is specifically made to fit car seating. 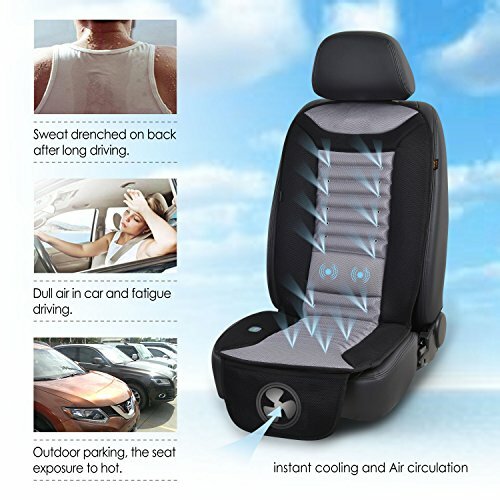 It has a great air-cooling function underneath the seat cushion, absorbing body heat and perspiration and releasing cool air all over the seat. Gone are the days when you’re sweaty, fatigued and uncomfortable during long rides. There are two motors located on the lower back portion of the seat that provides vibrating massage to soothe aches and muscle tension. You can turn the massage feature on with or without the cooling function. A 30-minute auto shutoff for the massage applies, but you can always restart it after if you want a longer massage. This device does not run on batteries; you need to plug it in the car or at home to charge it. Zyllion’s Shiatsu Pillow Massager is the most compact model on this list. Its ergonomic construction allows it to fit snugly on the small of your back and neck, and the 4-deep kneading rotating nodes mimic the Shiatsu treatment. With the adjustable straps, you can securely attach it to your car, sofa or favorite chair. This pillow also has a heating function that adds an extra soothing feel to the one using it. A 20-minute auto-shut-off feature ensures safety and prevents overheating of the device. While it’s certainly compact, this pillow may not be as satisfying for those looking for a whole back massage. Opt for a bigger cushion if you want your entire back relieved. AURUZA’s Vibration Massage Seat Cushion comes with 8 programmable nodes that provide relaxing vibration massage. It has 3 intensity settings for user’s discretion. The cushion also has built-in heating function that promotes blood circulation on your sore area. And it has an automatic shutdown function that could be preset at 15 or 30 minutes. 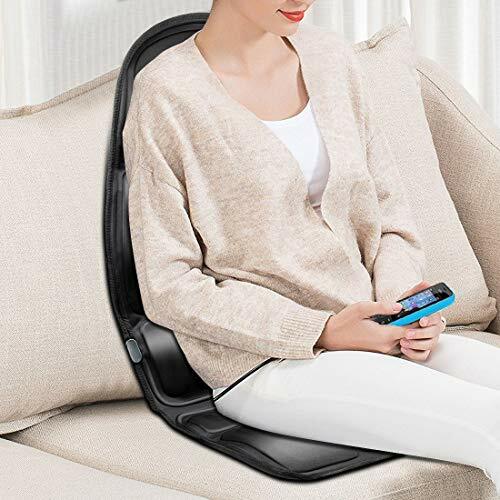 This massage cushion can be conveniently attached on any seat – the office chair, car seat or at home, and can be charged pretty easily via car charger or any electric outlet. This Massage Mat features vibration-type massage provided by 10 powerful vibration motors. It has 5 massage nodes that can be set in 3 different intensity levels. 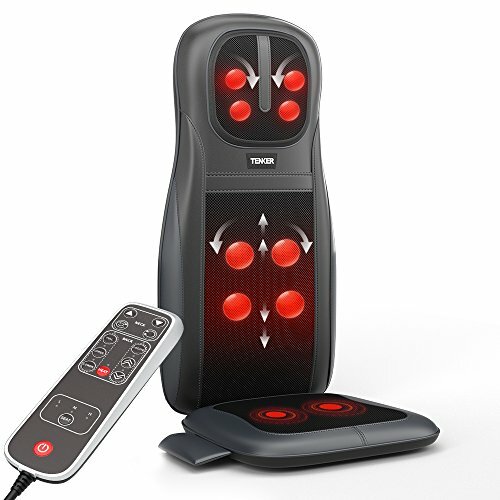 Plus, you can independently control 4 of its zones, pretty unique for a massage cushion. 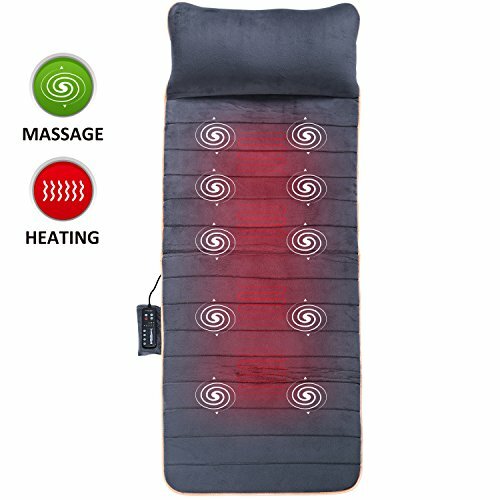 Aside from vibration massage, this mat also has heating function, which is also divided into 4 independent zones. A 30-minute auto timer for safe use applies, and it’s foldable for easy transport and storage. Massage cushions are the perfect choice for those looking to de-stress everyday. These 5 models each have different features to satisfy different needs. Which one is your pick?